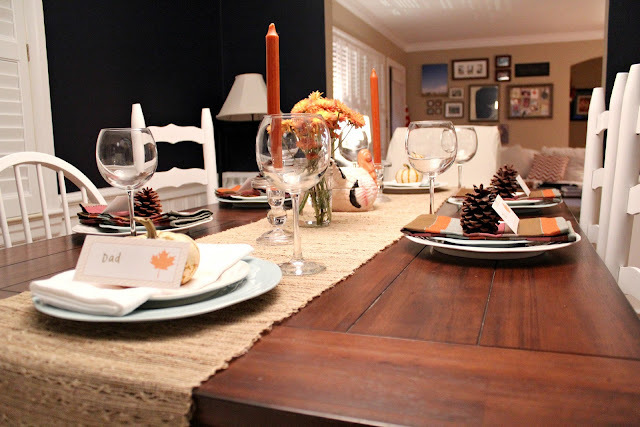 Welcome to my very first Thanksgiving table! All of you should be proud... I've started thawing the turkey, I've done all of the grocery shopping and I've set my table for Thanksgiving! Just call me Suzy Homemaker. Come on, turkey day! I decided to keep the table simple and sweet- many people have told me that even though they're beautiful, one big mistake is to junk up your table with decor, which doesn't leave room for food and for your guests to eat comfortably. So simple and sweet I left it. 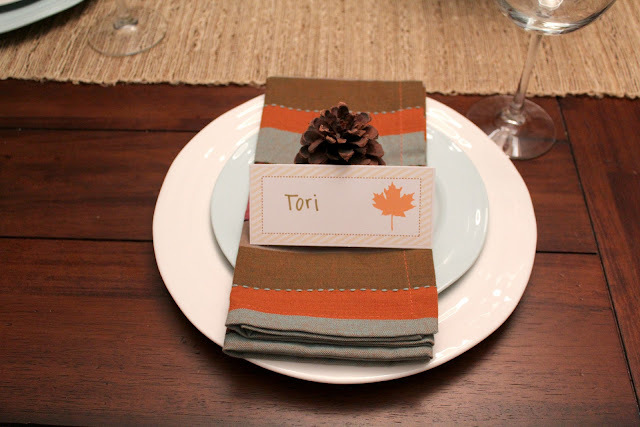 I used my everyday dishes (Portmeiron's Sophie Conrad in white and celadon from Macy's) and added the beautiful printed napkins (World Market) and a few natural elements to each place setting in the form of a pumpkin or pine cone. I think they work really well with my natural burlap runner (Target). I decided to save my "give thanks" cinnamon clove pumpkins to dress up the food table. 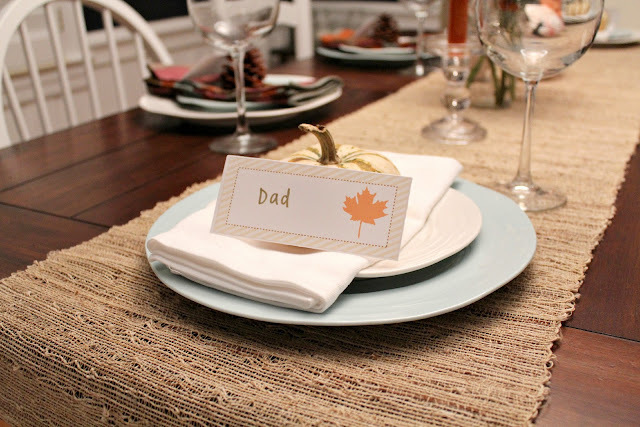 The place cards are free printables from the Handmade Home. 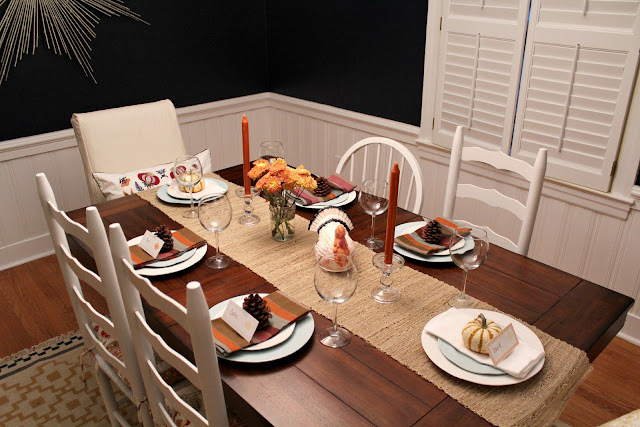 We are not a formal bunch when it comes to Thanksgiving, so I think this simple and sweet tablescape will be the perfect setting for my family to give thanks to God for each other, the food and our happy lives. Speaking of, I'll be back later this week to share the menu for our amazing feast! 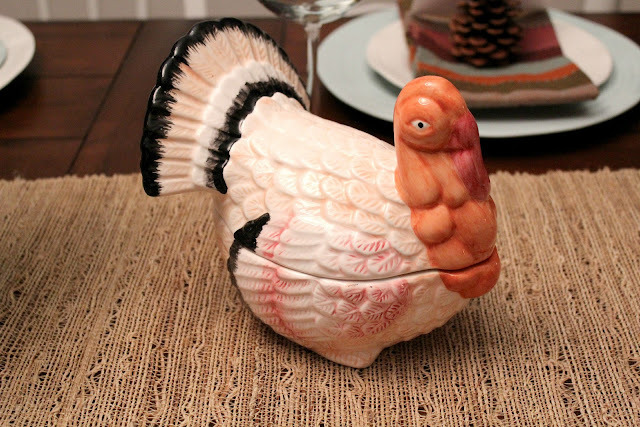 Are you ready for turkey day too? Psst! If you are looking for more Thanksgiving tablescape inspiration, check out Courtney's beautiful table here, Megan's gorgeous black and gold table here and Courtney's festive plum colored table here! These folks are talented!! looks beautiful! i love the natural elements. LOVE the burlap runner (or whatever it is made of)! Happy Thanksgiving! So pretty! I love the runner and the pinecones! Perfect for the holiday! ah love it rb! you just made me excited for turkey day. Absolutely love the way your table turned out! omg, I think need the burlap runner!! So pretty. love the color scheme. Yay - you're all set! I agree - simple is perfect for turkey day! I love it!! It's simple and looks fantastic! You look like you are going to have a wonderful Thanksgiving meal with your family. Exactly what the holiday is about! Love the burlap runner! Table looks great and so does the photography my dear! Wishing you a great Thanksgiving week! I love your style Michelle! I love your table! I'm all about simple and this looks perfect for Thanksgiving. I love the colors in the napkins and the plates are so pretty. Those seating cards are adorable too. Your table looks fabulous! 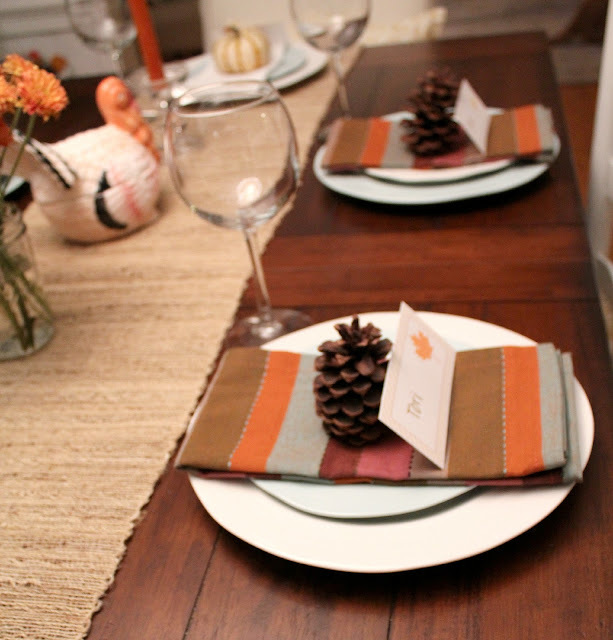 I love the pinecones & seating cards- such sweet touches. Simple and pretty is a huge thumbs up in my book. Your table looks really great and I'd love to be a guest there. I love the napkins. Good luck with your cooking. 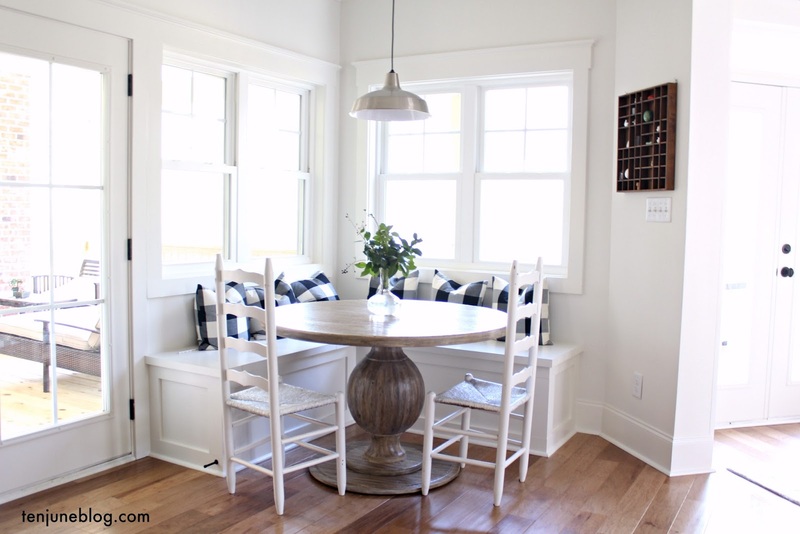 I love your table...looks like it will be an amazing day at the Ten June house!! looks great!! love the napkins and place cards! I love that you kept it simple! Just beautiful. Hope your 1st Thanksgiving is a huge success. My sil is hosting this year! This looks SO good. I love the pinecones and the place cards. Very nice! Beautiful table! Love those napkins! Looks amazing! I love the striped napkins! simple and chic - reminds me of you! perfect! simple and lovely.. i'm totally impressed that you are already SO ready! Way to go! Wow -- I LOVE THIS! I am your newest official follower. Your blog is beautiful. so beautiful MIchelle! HAPPY THANKSGIVING! Wow! 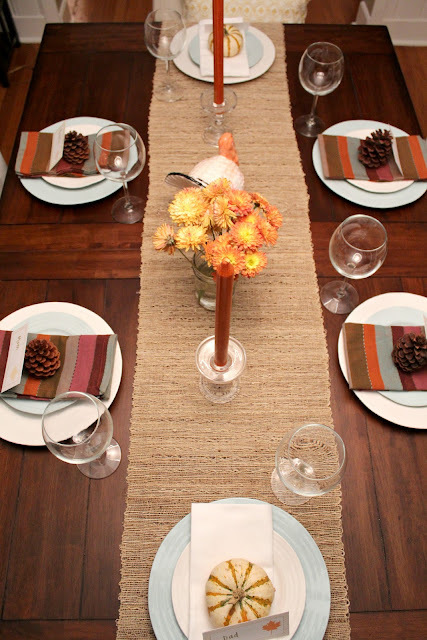 You would never know it was your first Thanksgiving table. It's beautiful! Love all the small details! So so elegant Michelle and you know I love your dining room! Those dark walls and mixed chairs are so fabulous!